In the twenty-first century, reading series, open mics, and slams have been integral to the poetry scene. Although some poets prefer their work to be read on the page, most poetic rites of passage include reading one’s work aloud in public. One welcoming place to read was R. Michael Oliver and Elizabeth Bruce’s Performetry, held once a month on Sunday nights at Columbia Heights’ BloomBars from 2012 to 2015. The cozy storefront with its hand-painted signs and home-made vegan food was just large enough to provide a diverse audience but small enough not to intimidate. Elizabeth, a native Texan, always greeted one warmly, and the event was an opportunity to catch up with friends and poets as well as to meet a variety of people over soup, bread and poetry. It is not surprising that both Michael and Elizabeth frequently spoke about their efforts to build community through Performetry and, even more importantly, bring together different communities and philosophies of poetry, if only for one evening each month. Elizabeth, in particular, mentioned how compatible BloomBars’ mission was with Performetry’s. 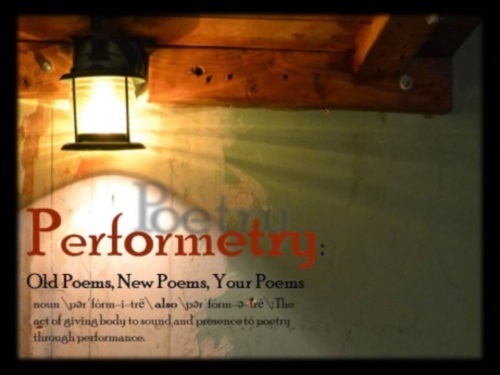 Performetry approached poetry from a different perspective, one grounded in Michael and Elizabeth’s background in the theater. As Michael stated, “Performetry emphasized performance,” and his reflections on the series often touched on audience and community as much as on language and expression. Indeed, the series could be considered very much a part of Michael and Elizabeth’s life together, which began, not with a poetry magazine or manuscript, but with Sanctuary Theater in the 1980s, a company that she characterized as “a marriage of art and politics.” Based in Columbia Heights’ Calvary United Methodist Church, this company shared its space in the “desperately poor” church with refugees from the civil wars in El Salvador and Guatemala, the Committee for Creative Non-Violence’s free food store with its “rotting lettuce” from supermarkets’ dumpsters, and even raucous parties that rented out the church hall. In the meantime, as Elizabeth notes, Columbia Heights itself was experiencing both extreme poverty and the Crack Wars. She recalled finding people sleeping in the church’s loft and even the sanctuary. Michael and Elizabeth’s company emphasized international, politicized theater, not only following their own inclinations but also reflecting the community that they had chosen. After a long hiatus, Sanctuary Theater continues today through Michael and Elizabeth’s involvement with DC’s Capital Fringe Festival, evolving to encompass his performance of classic literature. This summer he will be performing both Embodying Poe: Poetry-in-Performance and Song of Myself: The Whitman Project at the Fringe. All shows will be at Brookland’s Dance Place. Unsurprisingly, when I asked Michael and Elizabeth about the highlights of Performetry, they mentioned the moments when the community they built came together. One such moment was a final performance of their Acting for Writers workshop in which poets presented their work. In the seven weeks prior to this performance, local poets had learned about acting techniques and philosophy from Michael, a playwright and director whose Ph.D. is in Theater and Performance Studies; engaged in various exercises to become more comfortable with performance; and practiced the presentation of their work, turning their attention from the page to the stage. Elizabeth emphasized the “tremendous leaps” that the poets had made over the course of seven weeks. Later she reminisced about the connections that poets made with the audience as well as their “collective investment.” Another moment that Michael mentioned was a reading from the anthology Before There is Nowhere to Stand, a reading that not only drew the audience’s attention to the Israeli and Palestinian experience but also featured a different group of readers who were new to Performetry. They specifically mentioned Virginia author Mike Maggio and Montgomery College professor Stephen Bass. Unfortunately, this reading was held on Father’s Day, which limited the audience. The third moment mentioned was a very moving farewell party for D.C. Poetry Project member Akasha Wordsmith (Laneta J. Hill) who was moving to Newark, NJ. Elizabeth praised the young poet for the polish and sophistication of her artistic presentation. Jae October’s very powerful and personal work drew her attention as well. She also remarked on how much Performetry complemented Sanctuary’s work with the Fringe Festival, since Michael’s one-man shows on Poe and Whitman were developed through Performetry. Despite these moments, as Michael observed, the audience was “never as full” as he had wanted it to be. He compared the theater community and poetry community, noting that the former had a stronger grasp of its role in supporting its members. Both Elizabeth and Michael also commented that the diversity of the styles in poetry community may have been a factor in this difficulty in generating an audience. However, Michael also offered some ideas on how Performetry might be revived, potentially in the Brookland neighborhood where the husband and wife have lived and raised their family for many years. Although Performetry’s run at BloomBars has only just ended and the forces behind it are currently diverted by numerous other projects, the D.C.-area poetry scene could certainly use another open mic as friendly and welcoming as Performetry, especially for writers who may not fit into more established venues or more youth-oriented spaces. Such a space is also essential in highlighting the diversity of D.C. and perhaps even resisting the force of gentrification and homogenization. Well spoken (of course), Marianne, and informative! I appreciate the insight on poetry and theater, and on the generational nuances of the contemporary poetry scene. I feel like such a slug for not making even one of the work sessions, and Laneta's farewell. Have seen Michael perform though. Completely engrossing!